CLAY, Alabama -- Quarterback Will Smith scored three touchdowns and threw for another as the #3 Clay-Chalkville Cougars defeated the Shades Valley Mounties 31-6 in a Class 6A, Region 6 contest on Jerry Hood Field at Cougars Stadium Friday night. The Cougars defense gave up only two second hafl field goals to get the region win. Clay-Chalkville (5-1, 2-1) led 17-0 at halftime and didn't look back. "We were not very clean on our assignments on defense and undisaplined coming off an open week," said Cougars head coach Drew Gilmer. "We picked it up as the game went on and we need to get ready for next week. I thought Willy threw the ball very well with making some great decisions and I thought he had a really good night." 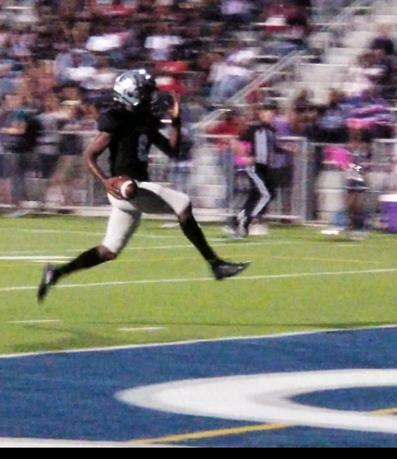 Miller opened the scoring for Clay-Chalkville in the game as he ran 23-yards up the middle for a Couguars touchdown. With 5:10 left in the first quarter, the Courgars took a 7-0 lead. With 5:20 left in the second quarter, Miller scored again on a 12-yard touchdown run up the middle and Clay-Chalkville led 14-0 late in the half. As time expired in the first half, Jaren Van Winkle kicked a 34-yard field goal as the Cougars did a great job on getting a field goal attempt with their two minute offense. The Cougars called timeout with :05 seconds left in the second quarter to setup the field goal attempt when the field goal unit was out on the field. Clay-Chalkville was in the wrong formation and Van Winkle added that it wasn't a big deal for the timeout. "We just needed to get people in the right play," said the Cougars kicker Van Winkle. "Not a big deal for me to wait during a timeout. We just needed to be right on the kick with the personel." With the field goal, the Cougars took a 17-0 lead into halftime. In the second half, Miller to Ben Heller on a 19-yard touchdown pass play for the Cougars gave Clay-Chalkville a 24-0 lead with 8:15 left in the third quarter. With 4:59 left on the scoreboard, Shades Valley kicker Braxdon Smith kicked a 27-yard field goal and that cut the Cougars lead to 24-3. "We made some mistakes on defense that we need to correct but we pulled through in the end," said Cougars defensive lineman DJ Dale. "Just small things we need to clean up on defense. Good region with that keeps getting up a good seed in the playoffs." With 8:33 left in the fourth quarter, Miller scored on a 3-yard touchdown run around the left end and Clay-Chalkville took a 31-3 lead midway through the fourth quarter. With 3:06 left in the game, Smith kicked a 24-yard field goal for Shades Valley and that made the final score 31-6 Clay-Chalkville. "We fought hard and did a pretty good job of executing," said the Cougars QB Miller. "Coach told me that he was going to run me so I was ready. I thought we had a pretty good balance on offense with the run and pass and we just need to continue to play that way. This was a good win for us." Miller completed 23-for-32 passing for 297 yards and a touchdown with 58 yards on 7 carries & three touchdowns. Courtney Braxton had 11 catches for 112 yards and Logan Pruett with 5 catches for 81 yards. Up next, Clay-Chalkville travels to Pell City while Shades Valley will travel to Oxford to play the Yellow Jackets.